Carriage bolts come with a square neck under a round head. They come fully threaded under 6” and they are excellent to use for wood to wood connections. At KD Fasteners, Inc.®, we supply a full range of carriage bolts. 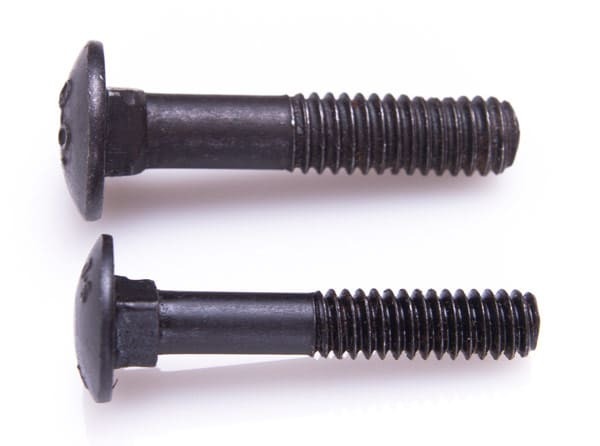 Ribbed neck carriage bolts (ribs under the head) in 18-8, grade 2 and grade 5. Short neck, round head (the square neck is shorter than standard) in grade 2 steel. Square neck, flat head (instead of domed head, the head is flat) we have them off the shelf in low carbon steel. We also supply carriage bolts in metric per DIN 603. We can make any style of carriage bolt per print with the material and plating that you need.